Hyten said it makes sense to design a prototype constellation and demonstrate it works before DoD invests billions of dollars in a major acquisition. COLORADO SPRINGS — Gen. John Hyten, commander of U.S. Strategic Command and nominated to be the next vice chairman of the Joint Chiefs of Staff, oversees operations involving some of the military’s most sensitive satellites that detect and track enemy missiles. Hyten has been insistent that DoD needs a layer of satellites in lower orbits to track targets much closer to Earth than the existing missile warning constellation that operates from geostationary orbit. 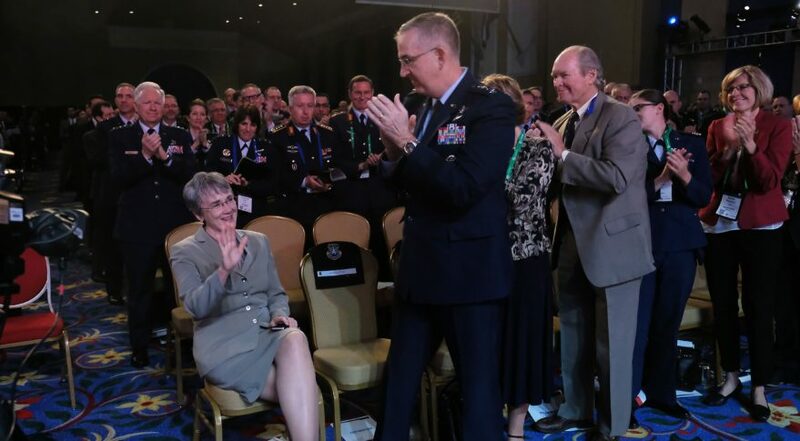 “That has to be a piece of the architecture,” Hyten told SpaceNews on Tuesday at the 35th Space Symposium. The job of designing a space sensor layer for hypersonic defense will be assigned to the newly created Space Development Agency, which has special authorities to acquire and test technologies with less red tape than traditional programs. If Hyten is confirmed by the Senate as vice chairman of the Joint Chiefs of Staff — replacing current Vice Chairman Gen. Paul Selva — he would be taking over as leader of the Joint Requirements Oversight Council, the panel of four-star generals that approves military requirements for new systems. Hyten believes DoD should take more risks and try new capabilities in LEO, for example. Meanwhile, Air Force Secretary Heather Wilson continues to raise concerns about the vulnerability of satellites in LEO. As to whether hypersonic defense can be improved by a LEO constellation, Hyten said it has to be tried and see if it works.